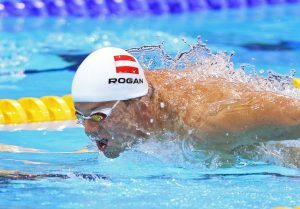 About the Authors: Markus Rogan won two Olympic medals and broke two world records during his swimming career. He carried the flag for Austria at the opening ceremony of the London Olympic Games and received the United Nations Medal of Honor for Civil Courage. 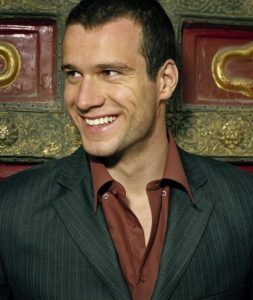 He now works at the Academy of Peak Performance (www.AcademyOfPeakPerformance.com) in Beverly Hills as a consultant to Fortune 500 companies and professional athletes. David Arluck is the Founder and CEO of the Fitter and Faster Swim Tour and Arluck Promotions. Looking at a giant Egyptian pyramid, we may wonder how did they build it so high? Similarly, watching one of our great peers compete at the Olympics, we wonder: how did she or he just break that world record? It turns out the answers have something in common. They did it one step at a time. The Egyptians started with placing one rock on top of another. And our world record breaker touched the wall after taking one stroke at a time. Yet, we can be overwhelmed by our own amazement of the results. We somehow don’t believe that the great pyramids started with one rock, or that a world record swimmer started with a rubber ducky in their bathtub. Many believe that success is innate – talent is “given” – and the great ones just wake up one morning and decide to excel. Which brings us to the mental game of swimming as well as life. It is the capability to focus on executing a given task, to the best of one’s ability, while maintaining awareness of both short and long term goals. This never means solely focusing on swimming a best time or breaking a world record. You reach the pinnacle by planning and preparing. You place one rock on top of another by taking one step at a time. The following is an assortment of “rocks” that helped me build my Personal Pyramid of Achievement. After years of working on my pyramid by improving parts that worked and eliminating parts that didn’t work along with consistent evaluation has enabled me to reach many goals throughout my formative years. Eventually I was able to break two world records. However, I make no claim to infallibility or perfection. Some rocks are stronger than others, all have a different function and yet together they make up one common purpose: to build my best possible pyramid. I understood the importance of each block and dedicated myself, as best I could, to its cultivation and development. 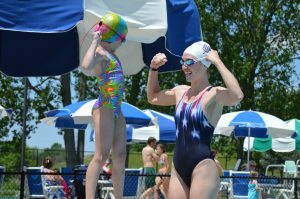 Being retired, from competitive swimming for three years now, has provided me with the luxury to look back at what I did well and what I could have improved upon. Now, at the beginning of the “next phase” of my life, I continue to refine my pyramid to reflect new goals. Become comfortable with the role you choose for yourself. For me, when I was ten years old, this was the moment I argued with my grandfather because he wanted to watch the news and I wanted to watch the Olympics. I defined myself as a swimmer and with it came the desire to watch swimming at the Olympic Games. You know how it feels, yet it is hard to put into words. It is an energizing love for a task, in which you are thoroughly absorbed, that is deeply meaningful to you. Some of us swim 12,000 meters daily and expect to be great athletes just because we endure a large amount of pain. That’s like an Egyptian picking up a giant rock and calling it a pyramid. 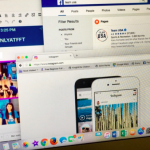 Instead it’s about being able to use the right tools for the right task. Sometimes that can mean swimming 12,000 meters, and at other times it can mean a night at the movies to just relax. Eating well, sleeping enough, stretching every day and practicing good personal hygiene should all be part of your daily regime. Let’s give our body the love and care it deserves. Whether you strive to make a varsity relay in high school or a spot on a National Team, the path to reaching your goals (and creating the next one) is strengthened when working with the right people. Find the coach that’s best for you. Seek the swimmers that make you feel like you’re part of a team. Everyone needs somebody to share personal victories as well as a shoulder on which to cry. For the younger ones among up, have a conversation with your parents about your goals. That’s not easy. It may the scariest part of this whole pyramid. Yet this is what cements the foundation of success. How far do you think you can go? What are realistic goals? Do you and your parents have the same expectations? Always remember that EVERY GOAL is important! We need strength in the water, in the gym and off the blocks. Work to build the right amount of muscle to maximize propulsion and minimize resistance. Remember, more is not always better. Being a muscle-bound Adonis is not the key to being fast – my friend Arnold Schwarzenegger is a terrible swimmer. The ability to focus when it counts and to chill out when it doesn’t count is vital. This is a big topic and a key element of the pyramid of success. We will discuss this in greater detail in upcoming newsletters. There are many good swimmers all around. Nobody has perfect technique. This is why world records continue to be broken. The best way to improve technique is to watch others. Watch videos of the best swimmers in the world. Do not practice what you haven’t seen. Ironically, some of the best technicians in swimming learn from athletes whose technique is not as good as theirs. This is because they keep an open mind and are continuously willing to refine their style. They use an interesting form of double confirmation. This means not just knowing what works but also asking why. This ability is the difference between just another a great swimmer and a great swimmer-clinician. 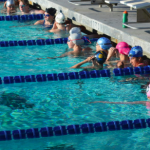 Being a great swimmer does not mean you will be a great clinician. Being able to share and to give constructive feedback is a more advanced skill. The Pinnacle: Competitive Greatness/Achieving your performance goal. All of a sudden, your personal goal, whether it is a world record or making your team’s relay, does not seem so far away. Imagine having spent years working on the previous eight tasks: Sense of Self, Passion, Clarity of Purpose, Health, Trust in your Support, Strength, Mental Skills and Technique and then stepping onto the blocks. The lane in front of you (or, for my backstroking friends: behind you) will look different. All you have left to do is put one rock on top of another. Reflection needs to be consistent. Often times people only “re-evaluate” after perceived failures. The process of reflection should be done both when goals are achieved and missed. Be fair to yourself and always look for ways to get better. 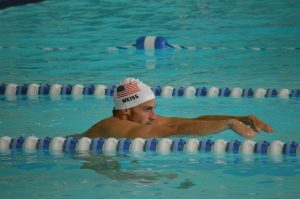 Many of the best swimmers in the world continue to tweak their strokes after winning Olympic medals… the process of improvement and reflection is constant. Take the time to re-evaluate a certain brick or how you prioritize each task. Never declare yourself a failure if you don’t swim a best time, and when you do, you can look for opportunities to improve. Use the bumps in the road! “Falling short” is actually a successful discovery of a way that doesn’t work. The best athletes, students, and professionals use shortcomings and losses to reflect upon their progress and to make adjustments for the future. We look at each “brick” in the pyramid. Even the great architects of ancient Egypt sometimes removed a rock that no longer worked. No two Pyramids of Achievement are alike. We would like to know how you structure yours. What’s your foundation? What do you consider an essential part of the structure? What is your pinnacle? Send us your personal version to PersonalPyramid@FitterandFaster.com. 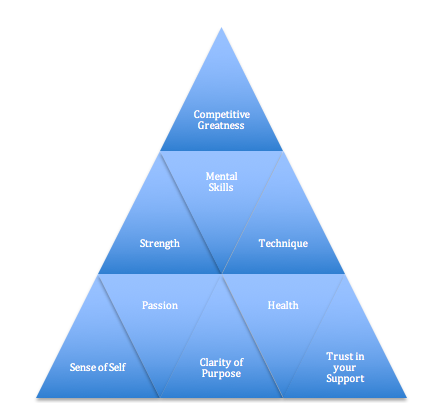 Building your pyramid is a process that can help you achieve goals and greatness. Tell us about one of the bricks of your personal pyramid. What are you doing to strengthen it, and how will it make you a better swimmer?